Use our Quick Quote tool to quickly find the best system for your needs in just four steps. What type of space are you cleaning? What is the size of the space are you cleaning? Are you concerned about eliminating odors or VOCs? What Are VOCs? Based on your needs, we have selected the . Why? Unit Price: $ x Units Why? How do we determine how many units you need? 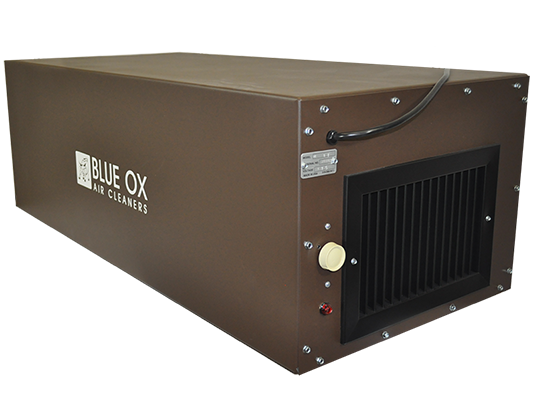 A blue OX media air cleaner is considered an "ambient air cleaning system" designed to run ambient shop air through a series of high efficiency filters and/or carbon depending on the application. When sized for 8-10 air changes per hour, you will create a constant reduction in the amount of airborne particulate in the room between 70-90%. We always recommend capturing the particulate at the source when possible but understand source capture is not always an option. Blue Ox air cleaners are often used as a secondary filtration system to source capture or when source capture is not applicable. Commercial: for a commercial application, we will offer a smaller, more attractive unit. This unit comes standard in brown, but is also available in blue or black. It has a small footprint, is easy to install and blends in nicely with commercial surroundings. In addition, this unit is quiet and low maintenance. Industrial: for industrial applications, we offer a slightly larger to much larger unit. These units include more filter media surface area so that the filters last longer. In addition, their size allows them to cover more space and reduce the overall required number of units. The size of the room helps to determine how many units will be required and how many CFM we should offer per unit. For a detailed epxlanation, click here. The best way to fight odors is with carbon. For more information on whether or not your odor can be handled with carbon, please view our Carbon Abosorption Rate Chart. No Odor: If there are no odors present, a standard two-step filter configuration will be used. Consisting of either a foam or pleated pre-filter and a 65% or 95% bag filter. Lite Odor: If odors are bothersome, but not the primary concern, we will suggest a filter configuration which sacrifices some of the filter media for 6-9lb. carbon after filter (depending on the unit). Odor is a Main Concern: If odors are the primary concern, we will suggest replacing more filter media with a 18-36lb. carbon cannister (depending upon the unit). These include some of the largest carbon densities in the industry. Single Phase: This is the most common power situation for most locations. When selected, the unit will come with a standard wall outlet. If you selected "I don't know", we have chosed this option for you automatically. Three Phase: Most commonly in industrial applications, the standard single phase motors have been replaced with 3-phase motors to accomodate the electrical needs. Typically, this will result in more CFM generated. Volatile organic compounds (VOCs) are organic chemicals which have a low boiling point and therefore easily release large numbers of molecules into the air. While certain VOCs are not toxic, a subset used in manufacturing can be harmful to your health and increased human exposure should be limited. Please complete the form below to receive a copy of this quote via email. Thank You! Your quote has been sent to your email address.